Bud Collins, the tennis historian and American voice of the sport in print and on TV for decades, has died. He was 86. His wife, Anita Ruthling Klaussen, said in a telephone interview that Collins died Friday at home in Brookline, Massachusetts, after suffering from Parkinson's disease and dementia. Inducted into the International Tennis Hall of Fame in 1994, Collins was well-known for creative player nicknames and turns of phrase that were as colorful as his trademark bow ties and one-of-a-kind pants created from cloth he collected around the world. Collins contributed to tennis' popularity and paved the way for newspaper reporters moving into broadcasting, becoming a familiar face to U.S. television audiences waking up for "Breakfast at Wimbledon" on NBC. Collins spent 35 years on that network's annual coverage from the All England Club and also worked as a tennis analyst for PBS, CBS, ESPN and Tennis Channel. "A legend and a gentleman with a unique style, Bud's analysis and on-court interviews were must-see TV for millions of American tennis fans," NBC Sports said in a statement Friday. Arthur "Bud" Collins was born on June 17, 1929, in Lima, Ohio, and went to Baldwin-Wallace College, followed by graduate school at Boston University. He coached tennis at Brandeis University, worked for the Boston Herald, then began writing for the Boston Globe in 1963. Collins described himself as a "scribbler and a babbler," and he mastered both forms. His writing style was unique, filled with fanciful adjectives and apt metaphors, spot-on references to art and history. Among the monikers he's credited with bestowing on star tennis players: "Fraulein Forehand" for Steffi Graf, and "Sisters Sledgehammer" for Venus and Serena Williams. He also wrote about other sports, including baseball and boxing. When Collins was inducted into the tennis hall, he quipped: "I've been hanging around there so much, they figured they had to let me in." Collins authored several books, including "Bud Collins' Tennis Encyclopedia," and won the Red Smith Award for sports journalism presented by The Associated Press Sports Editors in 1999. The National Sportswriters and Sportscasters Hall of Fame inducted Collins in 2002. The International Tennis Writers Association hands out a Bud Collins Award to recognize assistance to the media. 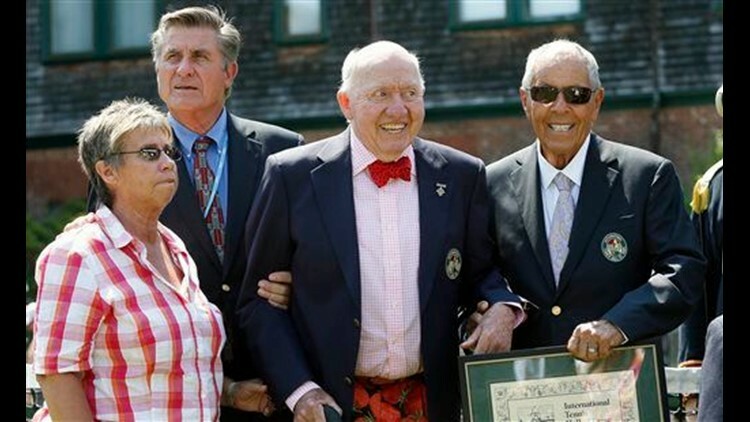 Last September, the U.S. Tennis Association named its Grand Slam tournament's press room the "Bud Collins U.S. Open Media Center" to honor him. In a statement Friday, the USTA said: "Bud was larger than life, and his countless contributions to the sport helped to make it the global success that it is today. Bud was a mentor to many, and a friend to many more. Our sport was most fortunate to be associated with a man of such character and class. ... He will be sorely missed by all of us who loved him — and by the sport he loved so dearly." Reaction from around the tennis world poured in. "Few people have had the historical significance, the lasting impact and the unqualified love for tennis as Bud Collins," Billie Jean King said. "He was an outstanding journalist, an entertaining broadcaster and as our historian he never let us forget or take for granted the rich history of our sport." Martina Navratilova wrote on Twitter: "RIP Bud Collins- Dear Bud- you proved you can be a great human, a great humanitarian & a world class reporter at the same time- much love..."
Chris Evert wrote: "Integrity, passion, intelligence,wit,compassion.... Friend... I, like many, will miss you terribly." Collins' survivors include a daughter, seven stepchildren and 11 grandchildren, according to Klaussen. Klaussen said a memorial service is planned for June at Trinity Church, followed by a reception at the Howard Gotlieb Archival Research Center at Boston University, where his papers are held.